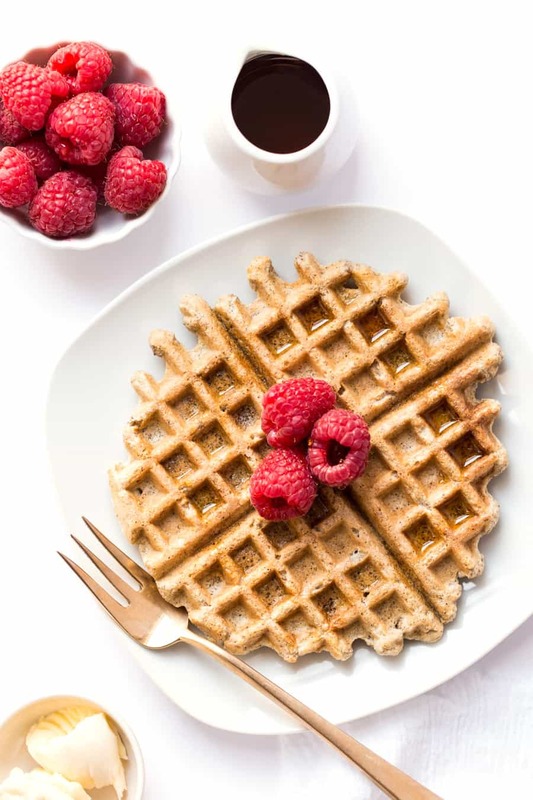 These almond flour waffles are what breakfast dreams are made of! With a blend of wholesome, high-protein flours they're hearty and fluffy at the same time! Happy Easter! I know for many of you, this is a holiday you spend with loved ones, where you have a big feast and lots of chocolate, but if I'm being honest with you, this isn't really a holiday that we celebrate. I mean sure, when we were little we did the Easter baskets and went to my grandmother's house, but now that I'm all grown up(! ), it kind of feels like any other Sunday in New York City. But let me just say, for all of those who celebrate this as a religious holiday, please don't take that statement personally. It's just how I grew up, no knocks any anyone else! So this year, our Easter is consisting of walks in the park, almond flour waffles, and probably some sightseeing in NYC (hoping it won't be very busy). Especially since the weather man is calling for low 80s and sun, you better believe we'll be spending the majority of our time outside. Waffles are probably my favorite breakfast food on the planet. Part of that stems from my Dad's Sunday waffle routine growing up, and the other part is that they're just like the most fun food to eat. First, you gotta make sure that every little square has some syrup. Second, you gotta have fun with the toppings. And third, it's all about how you cut them. Like does anyone else cut their waffles the same way each time? I like to cut each triangle down the crease and then cut them into three different pieces, making sure to dip the bite in the part of the waffle that has collected the most amount of syrup. Okay…I'm in heaven just thinking about it! 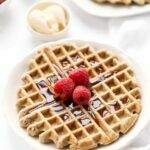 For today's waffle recipe, I wanted to create something that was light and fluffy, naturally gluten-free, and without all the starch that most GF flours/waffles come with. Setting out it was a tall order, but after about 10 tries, I finally nailed it. The base, of course, is almond flour, and to that we're adding quinoa flour and flaxseed meal. The quinoa flour adds a bit more protein while the flaxseed meal brings in more healthy fats and omega-3s. 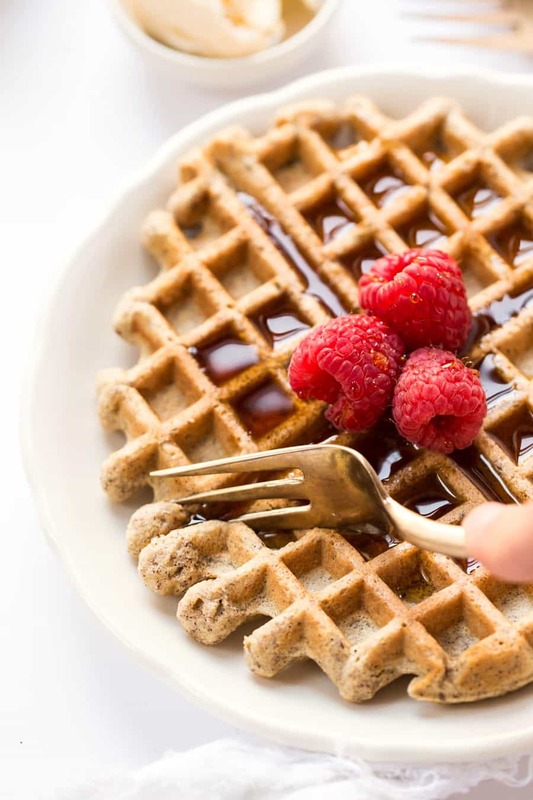 While they're not *technically* grain-free because of the quinoa flour, they are still very healthy, relatively low in carbs (in comparison to traditional waffles) and high in protein. 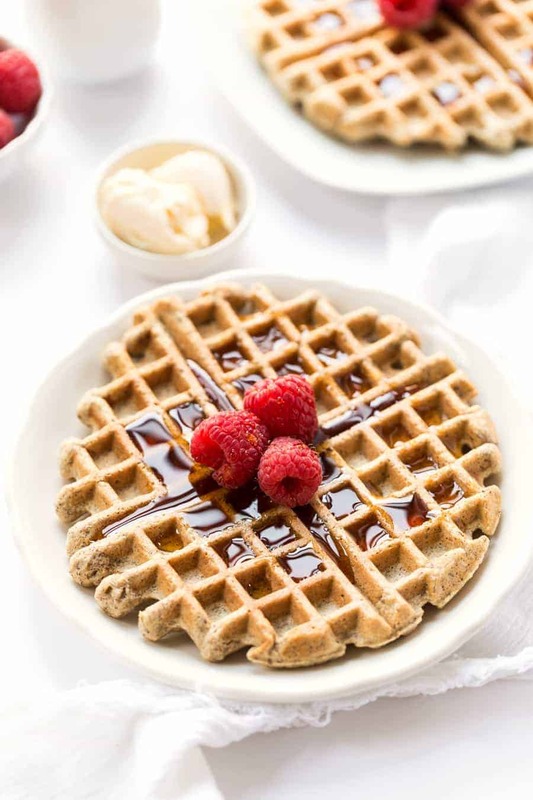 These waffles are pretty much the BEST way you could start your day! 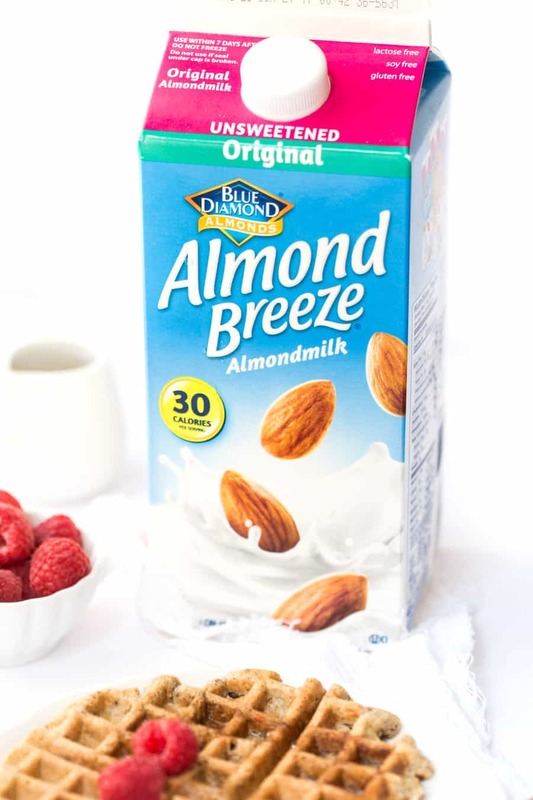 For the wet ingredients, we're using Almond Breeze Unsweetened Almondmilk, which is by far my favorite almondmilk out there. 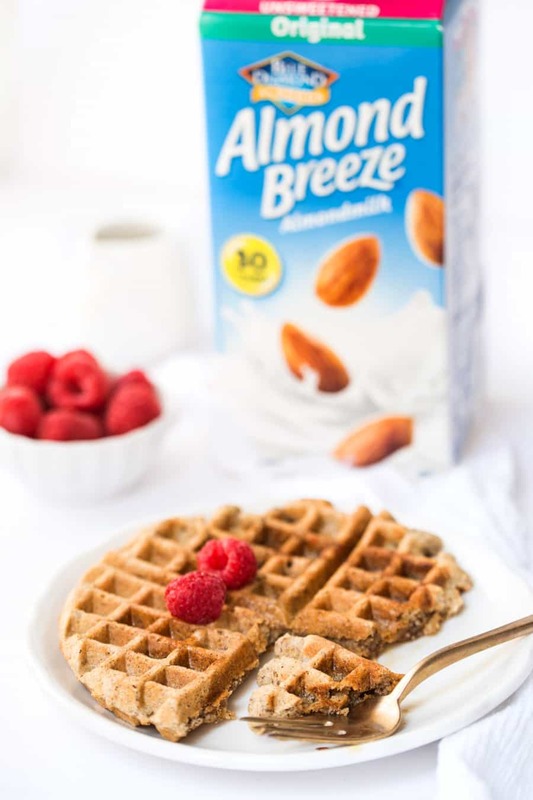 It's creamy and doesn't have a strong flavor, and since it's made from almonds, it complements the waffles perfectly. But like many of my other recipes, these waffles are pretty adaptable if you're not feeling the unsweetened original. Luckily, Almond Breeze has a bunch of flavors and blends to choose from. Vanilla would be amazing, the coconutmilk almondmilk blend would be delish, and the chocolate? Oh man, talk about decadence! The other key to making these waffles super fluffy, and how my dad taught me to make waffles, is to separate your eggs. 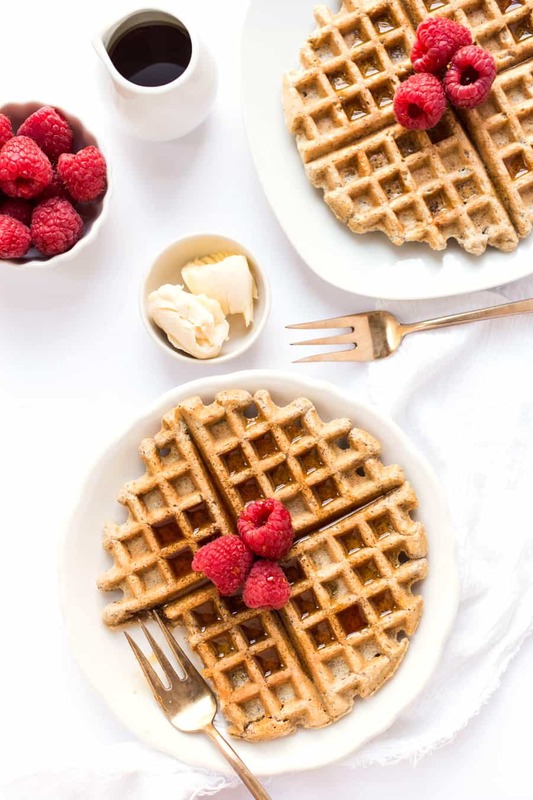 By whipping the egg whites into soft peaks and then folding them into the batter, you're left with this incredibly light batter which helps keep the waffles nice and light. And now that we have our waffles together, let's get to the fun part. TOPPINGS! But the list goes on and on! You can totally make these waffles your own, and make them taste different every time you make them, just by changing up your toppings. Or, if you're serving them on let's say Easter Sunday, you could even just make a waffle bar with ALL the toppings and let people pick and choose! Ohmygosh how fun!? One final thing about these almond flour waffles before I sign off to go make some for breakfast, they freeze really well! I like making a double batch and freezing my leftovers for a quick and healthy breakfast. To reheat them, I usually just pop them in the toaster for a few minutes, but you can also heat them up in the microwave. My favorite way to enjoy leftover waffles? In place of toast with peanut butter and sliced apples or bananas on top. Simple, quick, easy, high-protein, high-fiber, satisfying. Everything I could ask for and more! Hope you enjoy them and have a lovely rest of your weekend friends! Heat a waffle iron to medium-high. Separate the eggs into two additional mixing bowls. To the bowl with the yolks, add the almondmilk, syrup and oil if using, and beat together until smooth. For the whites, beat on high with an electric mixer until they can hold stiff peaks. Add the yolk-milk mixture to the dry ingredients and mix until just combined. Add the whites and gently fold until the batter is just combined again. Careful not to over mix as you don't want to deflate the egg whites. Grease the waffle iron and drop 1/4 cup of batter into the center. Cook according to your waffle maker's instructions until golden brown and lightly crispy; typically about 2 - 3 minutes. Transfer waffle to a wire rack and repeat with remaining batter. When ready to serve, top with desired toppings (I used raspberries and maple syrup here) and enjoy! Heya! I love this recipe and make it all the time. I wanted to ask however, is it possible to substitute the almond flour for gluten free flour and if so, what would the amount be? I would like to try making a vegan version of these. Have you tried them without eggs? They look delicious! I haven’t yet, but I think you could try aquafaba! I can’t find quoina flour. Any substitute? I think any other whole grain floru should work!